Graphic by Larry Milam, used with permission. 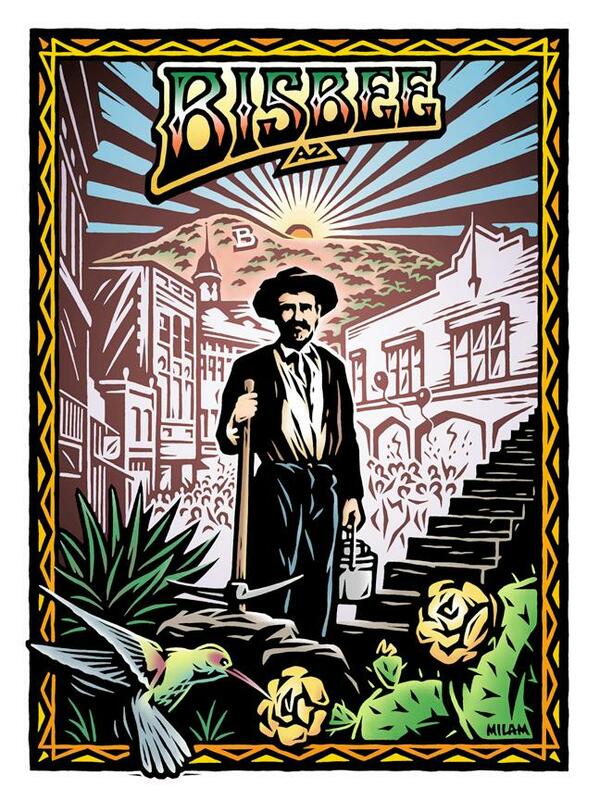 BISBEE, ARIZONA -- Local legend suggests that Bisbee has always been, as the town motto proclaims, "An American Original." According to historians, back in 1876 U.S. Cavalry chasing Apache warriors didn't like the water in local streams. It tasted metallic. But when outcroppings of silver were found, a soldier was sent to stake a claim. The man blew his "grubstake" on booze and poker. And so it goes in Bisbee, a curious blend of history, hype, ex-hippies, and a wacky sense of humor. Bisbee is a town of many claims, and the first was in copper. From the 1880s on, the Copper Queen Mine pumped out billions of tons, plus billions of dollars of gold and silver. The hills surrounding Bisbee still seem copper-tinted, especially during a Southwestern sunset. But copper's claim on Bisbee ended in 1975 when the mines closed, leaving locals to face the fate of ghost towns across the West. Then foresight and federal dollars staked another claim. And Bisbee can now claim to be the Best Historic Small Town in America (USA Today, 2016). Bisbee couldn't be much farther south and still be American. Located 11 miles from the Mexican border, the town is both tourist destination and home to some 9,000 residents, including many artists, craftsmen, and garden variety eccentrics. What other town would turn cement stairs into an annual foot race? Where else can you find a festival welcoming home turkey vultures? And how many costumed parades can a small town hold? A stroll through Bisbee is a stroll through America's evolution from industry to information to craft beer and boutiques. Downtown hosts the elegant Copper Queen Hotel, revived by a local who bought the dilapidated relic from the Phelps Dodge Company for a dollar. Strolling uphill, you find narrow streets snaking past former brothels and boarding houses, their faded walls adorned with murals and graffiti. And winding up into hillside scrub and cactus are 82 flights of cement stairs, built by the WPA during the Depression. Following paths once trod by mules, the stairs lead to homes perched on copper-tinted slopes. Such a setting was bound to attract American originals. So when the 1960s refused to die -- instead moving to counterculture enclaves in Colorado, Montana, and the Southwest -- Bisbee came alive again, host to shaggy beards, tattoos, motorcycles, and any number of alternative therapies. You can sample history by foot, or tour the old mine. But tourists rarely hear of an event that made Bisbee notorious in the annals of American labor. By 1917, the mines were on a hair trigger. Copper giant Phelps Dodge owned most of Bisbee, including the only department store, newspaper, hospital, and library. The Copper Queen Mine shuddered with blasts detonated while miners were still underground, toiling for a few dollars a day. Safety inspectors were turned away. Miners were strip searched. And the miners' union did nothing. Enter the I.W.W. When the Industrial Workers of the World came to Bisbee, a strike loomed. Bisbee's mayor telegraphed the White House, warning that "the whole thing appears to be pro-German and anti-American." But with the U.S. gearing up for World War I, no federal troops came, leaving Phelps Dodge a free reign. Elsewhere "IWW's" were arrested, jailed, killed, but Bisbee's response was another American Original -- running them out on a rail. On July 12, 1917, 2,000 deputized sheriffs rounded up men on a company blacklist. Under the gun, including machine guns on flatbed trucks, the men were loaded onto cattle cars and shipped across the sizzling desert. Some 1,300 were dumped near Hermanas, New Mexico. For the next few months, vigilantes ruled Bisbee, deporting "radicals" at random. Federal authorities later ruled the deportation "without authority in law, either state or federal." Miners sued all the way to the Supreme Court, where they lost. No mining officials were punished. The Bisbee Deportation was largely forgotten. Not even locals mention it much, being too busy having fun. On March 10, the turkey vultures returned to Bisbee. Turkey Vulture Weekend, an answer to the swallows' fabled return to Capistrano, featured live birds on display and giant bird puppets on parade. Next month, Alice in Bisbeeland will bring Alice in Wonderland costumes to these streets. In August, when daytime temperatures are "only" 90 degrees, Pirates of the High Desert will parade. Bisbee also hosts an annual blues festival, a plein air painting day, a gem show... And come October, the 28th annual Bisbee 1000 will send runners scampering along a grueling path up and down local stairs. New Yorker writer/poet Richard Shelton first saw Bisbee in 1956. 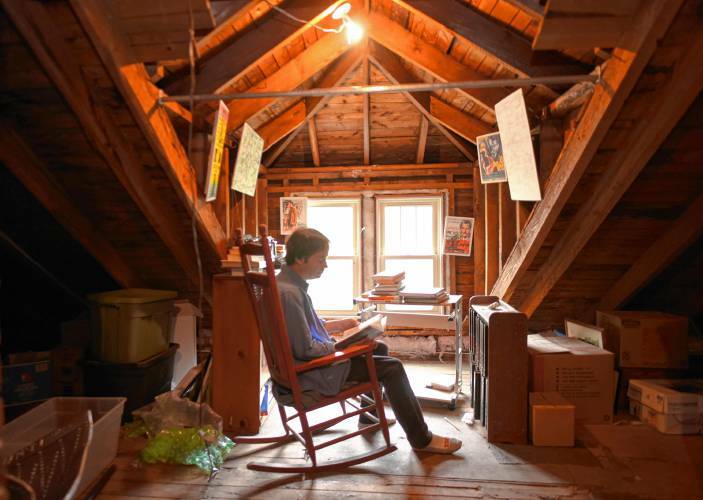 He found it "all piled on top of itself as if some child had poured toy houses down the sides of the mountains." Two years later, Shelton moved to Bisbee. He still lives here. In his memoir, Going to Bisbee, Shelton called his hometown "a strange little town. . . the strangest I had ever seen." Bisbee remains strange, seductive, an American original. And that's no idle claim.